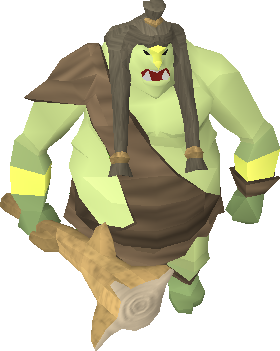 A Jogre is an Ogre that lives in the jungle, a so called Jungle Ogre. Jogre is the term used in short for these creatures. 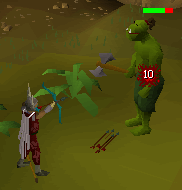 They are located on the island of Karamja, and there are many ways to fight them. Of course, this isn't your only choice. A Dragon Scimitar or an Abyssal Whip would work well here too. 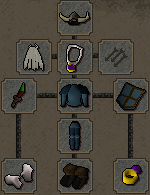 The boots should be the best you have, mine being black from a monster drop. 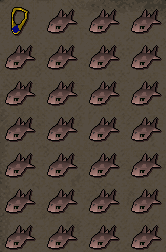 I would definitely make sure that I have at least a Legends' Cape or better before fighting these. I also think it's best to stay away from these guys until you have about 68 - 70 Defence or better. The reason for using a dagger superpoison is because it can hit up to a 150 with it. 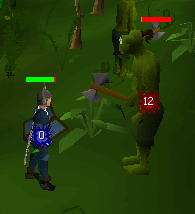 It is suggested that you use a 1-Handed Weapon so that you can use a shield in the other hand. You should be able to hit at least a 100 with the weapon that you choose. Now, back to the reason for me using a superpoisoned dragon dagger: this is because the special works well in bad situations, and in a situation like the above picture, the poison may (not always) kill the Jogre before it attacks you. The reason for the Games Necklace is so that you can recharge your Glory Amulet in case you forget that it's at 0. Strategy of getting there quick may be important. 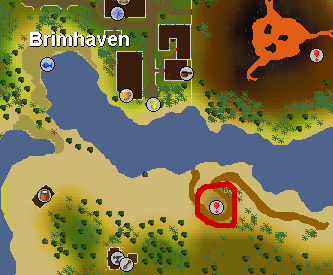 I find that the easiest way is to either bring 10gp if this is your first time and speak to Hajedy in Brimhaven and have him take you to Shilo Village. 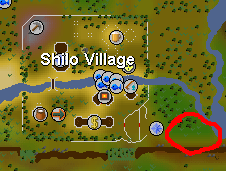 From Shilo Village, head out the gate, south, and then around as if you were going to take the really long way to craft Nature Runes and keep going until you come to the river. Go north until you see the log and cross the log, on the opposite side is a broken Gnome Glider and the Jogres. Another option would be to use the Gnome Gliders. 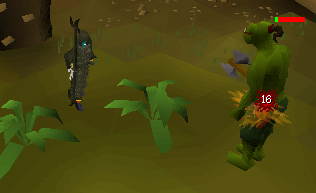 Take a Gnome Glider from Al Kharid to the TreeGnome Stronghold. 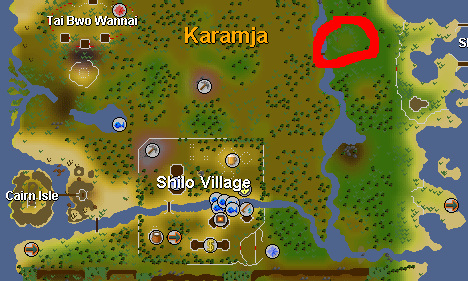 Then to Karamja, then run northeast and you should get there eventually. 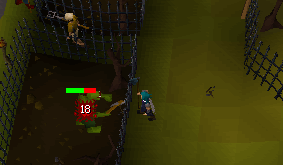 If this is your second trip, before you leave make sure you pick up at least either 3 bronze spears or 1 iron spear so you can do the trip again and pay Hajedy after selling the spears to a general store. Note: Sometimes Jogres will drop a Knife. Pick it up, because sometimes they will also drop two Pineapples and if you slice (not dice) the Pineapple, you will get four Pineapple Slices which is basically saying: "Here, have 80 free hit-points." 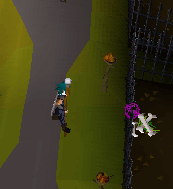 Jogres often drop a lot of useless spears, which I suggest you avoid picking up until you are almost out of food. 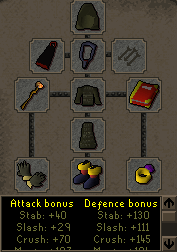 Also, if you have started and completed the Rag And Bone Man Quest, Jogres will drop a single Jogre Bone. Also a good reason to kill Jogres is because sometimes they drop multiple bones which are good for prayer. 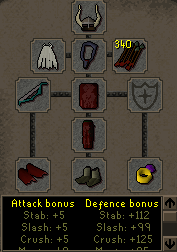 As well as that occasionally Jogres drop Level 2 Clue Scrolls, Dragon Shield Left Halves, or a Dragon Spear. The following is a list of possible drops from Jogres. Sometimes Jogres will drop challenge scrolls. 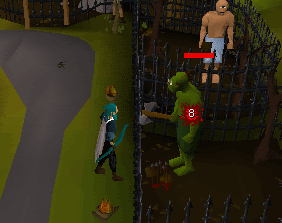 The place to fight a Jogre Champion is in the Champions Guild. The Jogre Champion is level 107. The Jogre Champion can not be hurt by ranged attacks, in other words you can't use bows, arrows, knives, darts, javelins. Note: I recommend no better than the Chaos spells. Note: I suggest steel arrows or better. 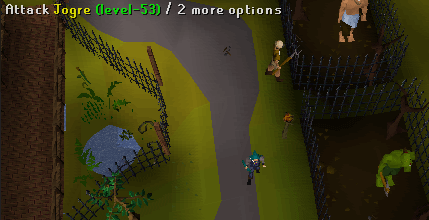 In the Ardougne Zoo there is a cage in the southeast from the entrance with a jogre in it, directly south of the one with the Cyclops. Make sure you can cast telekinetic grab and bring an air staff and law runes with you here. Note: Usually you will be the only one there, other then the occasional passerby, good if you want to get far away from people.